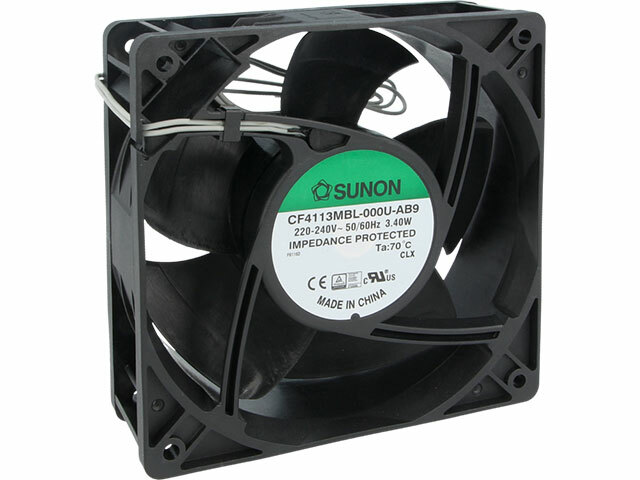 Our offer includes EC fans from SUNON which are an energy-efficient alternative to AC fans. We particularly recommend the CF4113MBL-AB9 fan which is an equivalent of the popular DP200A2123XBT AC fan. The CF4113MBL-AB9 is silent, lightweight, and highly efficient. It has the IP55 protection class. Its energy efficiency is evident in its very low power consumption compared to AC fans. The fan's enclosure and rotor are made of thermoplastic materials, ensuring operation in temperatures ranging from -25°C to 70°C. The fan has two 330mm wires. The CF4113MBL-AB9 can be used in many applications where energy efficiency is crucial.